All Grain, an Edelman classic, brings your designs to life beautifully. 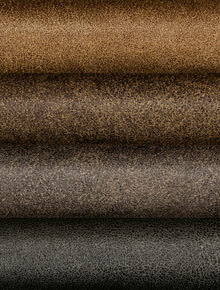 It is supple with a soft inviting texture, yet strong and durable enough for demanding high-traffic applications. 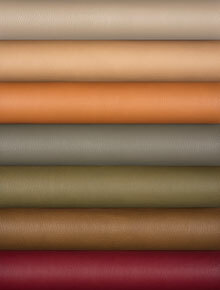 This small pebble grain leather is available in a broad palette of enticing hues, and custom coloring is available with low minimum requirements. A radiant leather with chromatic intensity and deep undertones, All Grain Noir’s striking rich metallic look is achieved with our exclusive metal oxide-and-resin finish. Add a touch of glamour to any high-traffic area. 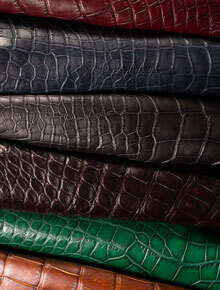 When your designs call for exotic and authentic alligator leather, look no further. It’s wild-harvested under the strictest environmental regulations and crafted in a renowned Louisiana tannery to retain its natural, unique beauty. American Alligator brings a bite to special settings. 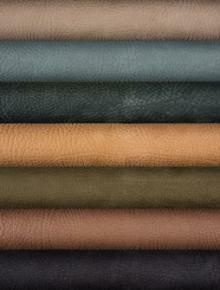 Vegetable-tanned and hand-finished using old world techniques, our carefully selected calfskin has an antiqued patina that grows deeper, richer, and more beautiful over time. This is the ultimate in leather craft, adding rustic appeal to all settings. 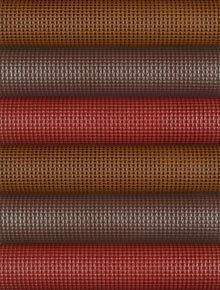 We emboss a deep, textured weave onto the softest suede to create Basket Weave. The embossed look adds unique interest and appeal to this already luxurious material. 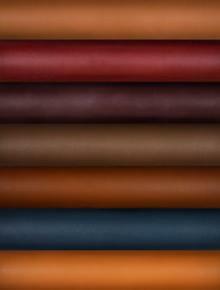 Perfect for vertical applications and more, it’s available on any of our stock Royal Suede colors. When your designs call for leather to take center-stage, Big Foot makes a big statement. This large natural grain leather with distinctive hand-tipping delivers a powerful impact. It’s a dramatic, durable choice with immense appeal. Crafted to feel soft and worn-in, Brulée is an instant heirloom. It’s finished with subtle hand antiquing for a mottled, perfectly imperfect appearance — no two hides look the same. This is leather with casual, comfortable appeal. We’ve recreated the essence of soft, supple lamb with larger and stronger calfskin hides — providing you with the best of both worlds. 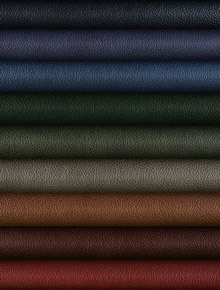 Our Cashmere Calf leather’s durable finish makes it ideal for use anywhere. Custom coloring is available with low minimum requirements. 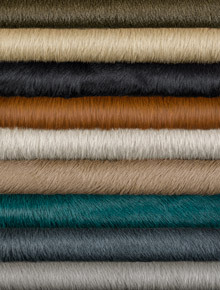 Add fun, flair, and high energy to any surrounding with Cavallini hair-on hides. 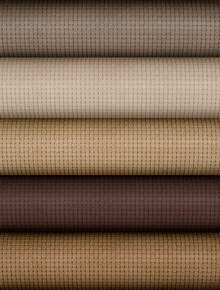 Available in subtle neutral and natural hues, as well as statement-making colors, Cavallini stands apart from the herd. Bringing textural elegance to any interior, Crowned — with an alluring diamond pattern on our Luv-A-Bull leather — is a classic reimagined. A light protective finish adds peace of mind, while still allowing the leather to patina beautifully. 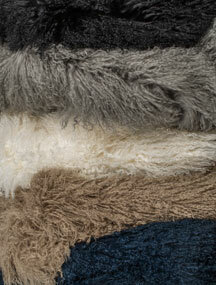 The thickest and curliest of our shearling collection, this Spanish lambskin adds comfort and warmth in any interior. 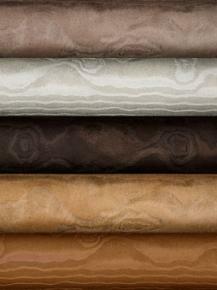 These sumptuous hides appeal to the senses with their lush, inviting texture. Crafted to wear in beautifully from the moment it’s used, Dashing, with great depth and movement of color, is all about casual comfort. 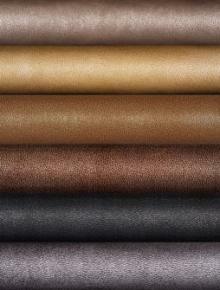 This smooth, versatile leather responds quickly to its environment, developing an inviting patina with time and use. 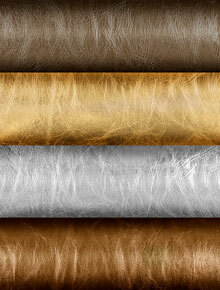 Demi Cow’s shimmery metallic foil finish, over luxurious smooth cowhide leather, lights up any setting. 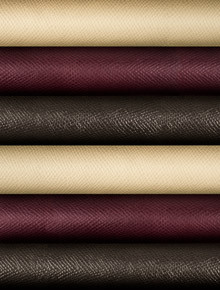 With its glamorous look, this seductive leather will bring a shine to clubs, bars, lobbies, and more. 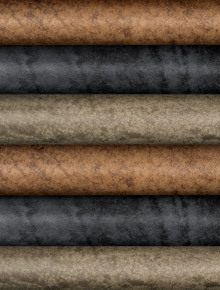 Artfully worn-in and weathered, this leather embodies a casual, broken-in, rustic look. 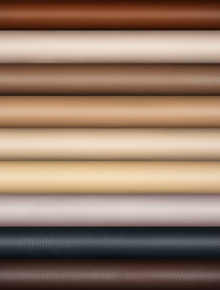 Our standard palette complements its finely-aged appearance. Dream Cow hides are big, beautiful, and strong with a durable protective finish. Crafted for performance and readily accessible, this reliable leather is at home in all high-traffic areas. It’s perfect for large hospitality and contract projects. Choose from over 25 standard colors or go custom to match your vision. Vintage-styling perfected, Drifter, a true rough-out, is waxed and tumbled for a time-worn appearance. An ode to the Wild West, this suede exudes perfectly worn-in casual appeal. Subtle, natural aniline-dyed colors with a light finish and touch of wax offer a luxurious hand and a look that will patina with age — creating a simple, easy-going leather. These kip hides offer higher yields with more square footage than calf, with the same softness. 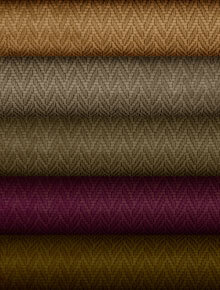 Gaufrage is Victorian richness re-imagined for contemporary settings. 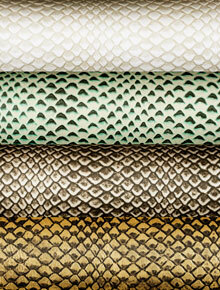 It’s a timelessly elegant pattern embossed on soft, silky suede. 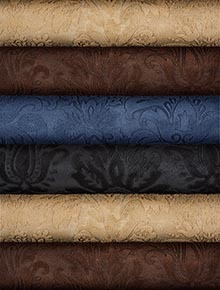 Gaufrage is available in all of our Royal Suede standard colors. Glitter adds just the right sparkle, just about anywhere. We begin with a rustic suede and mix in metallic dustings to create a subtle glimmer. It’s best for vertical applications and lighter traffic locations. 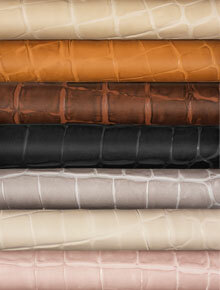 Our expertly-embossed leather boldly reimagines crocodile hide. Add a touch of classic sophistication — to settings from executive offices to libraries to dressing rooms and more — with this unique, statement-making choice. 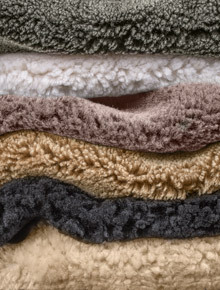 Imagine the ultimate comfort, warmth, and rich beauty of Kashmir Shearling in your designs. Our Spanish lambskin has a luxurious hand with ironed wool that is unbelievably soft to the touch. Kid Calf, our butter soft, lightweight calfskin, looks and feels like kidskin — only stronger with larger hides. With a delicate, chic look, it’s versatile enough for a variety of applications. 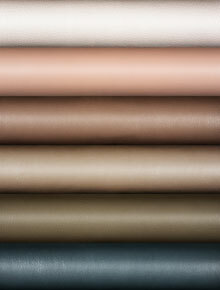 Luster Leather, the pearl-finished sister to our Royal Hide, exudes a subtle, sophisticated sheen. Think Art Deco and Hollywood’s elegant age of the Silver Screen. This is livable glamour at its finest. Becoming more beautiful with time and touch, Luv-A-Bull effortlessly enhances settings from residential to retail. 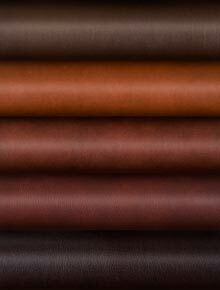 The leather is aniline-dyed, waxed, and lightly-finished to produce rich, undulating colors that will begin to patina gently from day one. 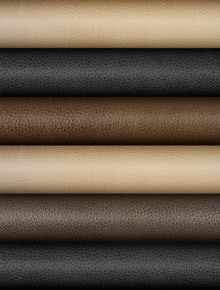 These large, luxurious, natural hides are available in a classic leather palette. We use only the best hides to produce our polished calfskin. Luxe Calf is soaked deeply with rich dyes, then heated and pressed to impart its alluring shine. This classic Edelman leather is pure, strong, and full of depth. It will patina gracefully with time and use. Big, beautiful, and durable like all our Dream Cow hides, Metallic Dream Cow comes with an added shimmery pop. Crafted for performance, this medium grain luxury leather is at home in high-volume, high-traffic, high-visibility environments. We emboss a rich pattern, inspired by classic French faux bois, onto our soft, water repellent Royal Suede. The result is Moire. 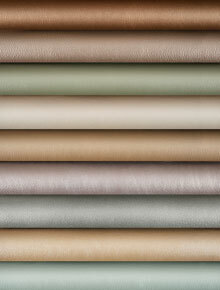 This leather, evocative of silk linings from the 1930s fashion houses, adds a unique textural touch to special settings. Have fun with the lush look and appeal of our natural long-haired shearling. This Spanish lambskin adds a playful warmth to accents and more. Our timeless, trustworthy vegetable-tanned leather is crafted from the highest quality raw materials. With a smooth, rich look and tight grain, it’s highly customizable, versatile, and durable for high-traffic areas. It’s great on hard surfaces like table tops and wall panels. We take Napoli, our vegetable-tanned classic, to new dimensions with a deeply-embossed, visually-appealing woven pattern. Bring a unique luxurious look to all high-traffic environments. Old Shrunken Buffalo Bull brings your designs to life with true Edelman originality. An ancient formula shrinks our exceptional hides during the tanning process to create one-of-a-kind results. Coloring and hand-antiquing add a rich two-tone look to this large grain leather. Custom coloring is available with low minimum requirements. Our beautifully-embossed faux Ostrich leather embodies the exotic appeal of the real thing — in high quality, full grain cowhide. This unique hand-antiqued choice is classic, timeless, and always in fashion. 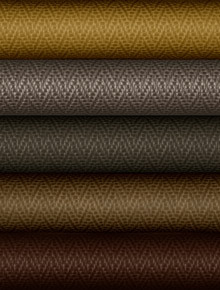 Our genuine Malaysian python leather is a truly exotic and unique choice. This is authentic, chic, high-end luxury with character — picture it in a TriBeCa loft or a Highland castle. For California clients, Anaconda is available. Rugged and refined, this full grain leather doesn’t just withstand time — it responds to it, wearing in beautifully. Ranger is aniline-dyed, lightly-waxed, and tumbled to burnish the grain and add depth. 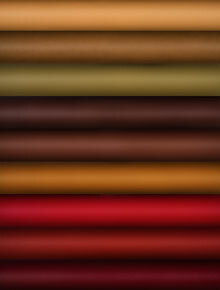 Colors take incredibly well to this naked leather, allowing for rich, intense, bright hues. 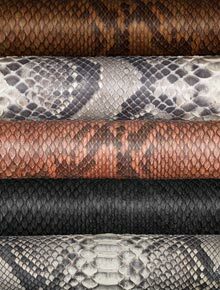 Our hand-antiqued, embossed faux Rattlesnake offers the look you love in our durable cowhide. Its dramatic texture evokes Art Deco and Art Nouveau styling with a fully modern twist. Customize colors to match your imagination. 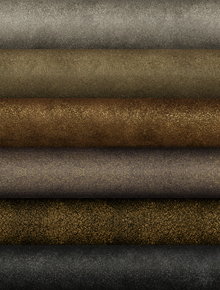 A true classic, Royal Hide has the elegance and strength to make it a mainstay. It’s perfect for any lived-in environment — with kids, pets, food, drinks, and more. This is luxury with a practical side — large hides with high yield, a durable protective finish, and availability in over 50 standard colors. Custom coloring is available with low minimum requirements. Royal Hide brings your designs to life beautifully. 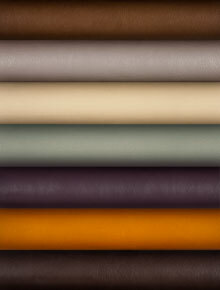 Add a touch of elegant luxury to your designs with soft, supple Royal Suede. 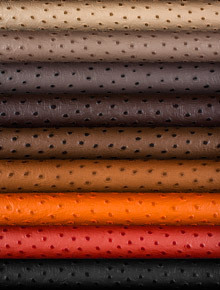 This water and stain repellent leather comes in an alluring palette of colors. A great choice for accents, it’s sensitive to direct light and will fade over time. Russian Modernaya, with its subtle crosshatch embossing, adds elegance to any design. 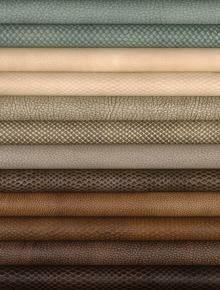 This leather is crafted for settings spanning contract, residential, and hospitality. This vintage-inspired, pebble grain embossed leather is modeled after riding boots an old Scottish shoemaker crafted for his royal clientele. It’s a classic look with built-in ruggedness and comfort. Durable and customizable, Scotch Grain works everywhere. 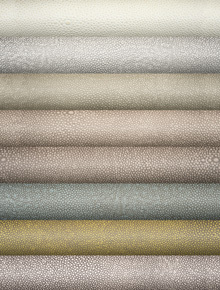 Our Shagreen cowhide offers a uniquely opulent, rich texture. 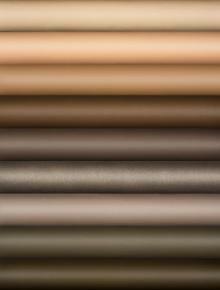 Its palette includes soft, alluring colors that shimmer and glow, and saturated shades that add drama to any room. 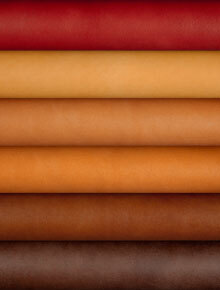 This durable leather is ideal for upholstery, furniture wrapping, and vertical applications. Shrunken Buffalo Bull is rooted in history as the original Edelman Leather. These strong buffalo hides were described by Teddy Edelman as "the strongest, boldest leather in the world." With a durable protective finish, this is leather that works for you. With a hand-rubbed, hand-antiqued metallic texture, Siamese Carabao adds a stunning element to any piece. 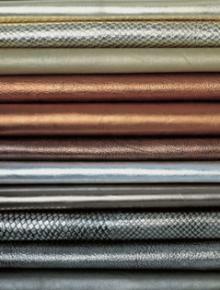 This embossed foil leather creates a special allure. Stella is a true star in the Edelman galaxy. This supple, tight grain, durable leather is perfect when high performance is a must. It’s designed for travel, leisure, and modern living, where luxury and real life — kids, pets, food, drinks — intersect. Use everywhere you imagine beautiful, classic, understated leather. This truly everyday choice is available in over 30 standard colors. A modern classic that’s strong and elegant, this large natural grain nubuck is versatile for settings that require comfort and sophistication. Picture it on a wing chair or any thoughtfully-placed leather centerpiece. It is sensitive to light and will fade over time. The name says it all — Supersoft is the softest of soft calfskins. 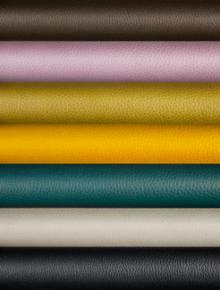 Expect saturated colors and vibrant hues from our pure, aniline-dyed calfskin. 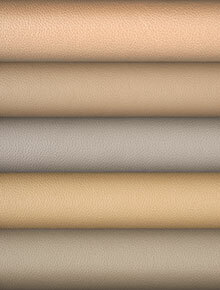 Ideal for light to medium-traffic settings, this stunning and comfortable leather evokes a West Coast mood. We treat this leather with an ultra-deep woven embossing, then mill it for a smooth hand. Texas Weave works well in any demanding environment. It’s available in a classic Old West palette. 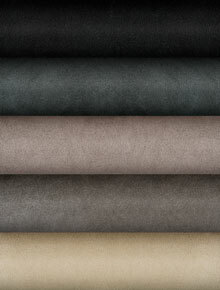 Add a touch of vintage Italian elegance with our interpretation of Saffiano leather. Hides are vegetable-tanned and hand-antiqued for a unique look and comfortable feel. Crafted from big, beautiful, natural grain hides, both soft and strong, this is leather that will last a lifetime — wearing in, not out. It’s meant to be seen, admired, lived on, and most of all, enjoyed. It’s great for well-used pieces like sofas, but also elegant enough for fine dining rooms. When you think of natural, real leather that takes centerstage, think of Whole Grain. 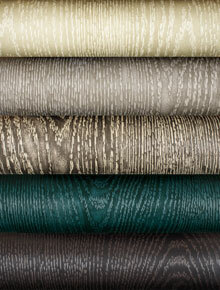 Faux bois at its best, our embossed, hand-antiqued leather evokes the timeless beauty of the finest wood grain. 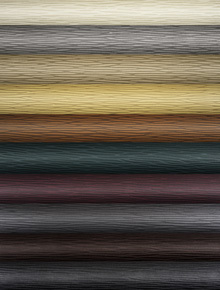 It’s perfect for countless upholstery options — imagine it on wardrobes, dining chairs, wall panels, in lobbies, and more. Worn Leather embraces a perfectly imperfect, lived-in look. This soft, worked-in nubuck feels like an heirloom immediately. It evokes a vintage appeal, like a fireside chair after a century of use. 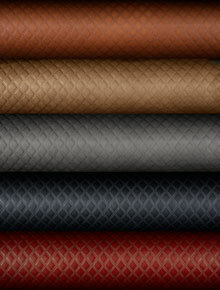 With a small emboss for subtle texture, Woven Leather offers a tight, crisp look for a truly woven effect. Treated with a durable protective finish, it’s suitable for a variety of uses, including chairs, tables, ottomans, and vertical applications. Zig Zag brings Art Deco styling to modern life. Embossed with an engraving from 1925, our silky soft suede reaches new dimensions with layers of texture. Available on our Royal Suede collection, it is sensitive to light and will fade over time.